Granada: home of free tapas – what a fine thing! You really do not need to spend money on food in Granada city (or province) if you go for the free tapa option. Just order a wine, beer or soft drink and wait to see what turns up. A few drinks and that’s lunch done – or even supper. For between 10€-15€ (£8-£13) you can enjoy, say, five drinks and some delicious food. You also don’t need to be an expert in what you’re eating: sizzling prawns in olive oil, bacalao with fresh tomato sauce, pickled fish salad – the list goes on. You could choose things from the menu or upgrade to raciones and start spending money (a larger portion normally around 7€-10€) but trust us; enjoying a different tapa by hopping between bars is much more fun – and you won’t feel bloated with food. Remember this is a tour of free tapas, not a restaurant meal guide. These places are well tested by us (usually at lunchtimes) and are, in the main, all near each other. By ‘best’ we mean the combination of location, ambience, food and staff. Drinks average around 1.80€ to 2.50€ – and 3.50€ for a slightly better wine. On the subject of wine: most bar owners – especially in the smaller establishments like Saint Germain and Taberna La Tana really know their stuff – so just ask if you want to try, for example, a local wine. There’s a location map at the bottom of the post – or you could go straight to it here. An institution in Granada and a great place to soak up the atmosphere. Arrive at lunchtime and stand at the bar – it’s a fabulous, fun, noisy experience in a traditional bar. Enjoy a vermut (2.20€) while taking a selfie with the huge bull’s head above the bar (the poor thing). Small but perfectly formed, La Tana is famous for its choice of wines by the glass (around 70). Owner and sommelier, Jesús – and his sister Luisa – are happy to suggest a wine to suit and the tapas are sublime. Enjoy a local wine from the Sierra Nevada. The place is named after La Taberna de Ana. 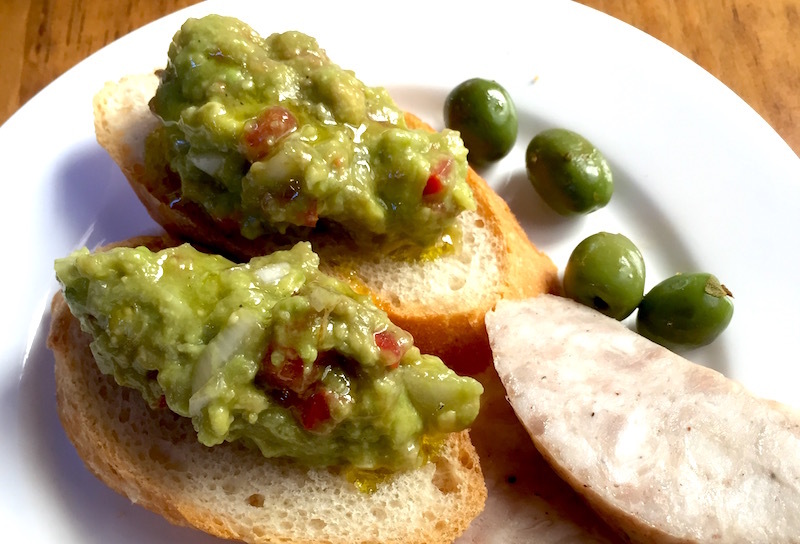 Example tapa: avocado and tomato on bread with white sausage. A moody French-style bar with an interesting interior (and a love for musician Tom Waits). The tapas, ambience and music are all great meaning it can get packed at certain times. A real gem and especially fun on a Saturday lunchtime. In the shadow of Granada’s cathedral, ‘At the foot of the tower’ couldn’t be more aptly-named. Easy to miss it’s the perfect stop for a tapa of whitebait or tortillita de camarones (shrimp fritter). Small, unfussy and with attentive staff, don’t miss it. The paid-for tapa menu is great too. Example tapa: those delicious crispy fritters! Brilliantly-run, modern bar popular with well-dressed locals. In the trendy Realejo district, it’s a good spot for people watching and the staff are warm and attentive. We always tuck ourselves away in the corner. The house red rioja (2.20€) is decent. This stands out among our choices for its Middle Eastern tapas (which you can choose). Its dark but colourful interior with walls full of photographs is an oasis of calm – until it gets busy. They do a ‘bottle of wine and tapa’ deal. A great – almost hippyish – place to chill. One our favourites for the freshest and tastiest seafood set in cool, white surroundings. Perch on a stool and watch the world go by in Plaza de Gracia. A cold beer is all you need. There may even be a bored clown outside scaring the children. Tucked away in a side street near El Corte Ingles this bar is great for its choice of tapas which even includes chicken curry (well, a Spanish version). They sell locally-brewed Sacromonte beer which is delicious. Located down a quiet side street near the Corral del Carbón this modern place has great staff and delicious tapa. Either sit at the bar opposite the open kitchen or grab a table for a proper meal. Either way, it’s an enjoyable bar to pop into as part of your tapa tour. Look away now if you don’t eat meat – EntreBrasas (‘between coals’) specialises in it and the waft of grilled flesh pours from the kitchen (including Kangaroo). The tapa can include 6-8 pieces of delicious meat, or perhaps some pigs head with salad. It’s on the touristy street of Navas. Located on a swanky shopping street not far from..er..Burger King, this bar does delicious, modern tapas – and often of the type not seen elsewhere – although it’s a bit more expensive than other places.